For the leaders of the Islamic Republic, the real enemy is within. Iran is facing a threat even more severe than the Stuxnet computer virus, a sophisticated line of code which was reportedly sponsored by the U.S. and Israel, and which destroyed some of Iran’s uranium centrifuges in 2010. In Persian, this affliction is called Siyasat Bazee – in English, playing politics. The precipitous fall of the Iranian rial against the U.S. Dollar, which has depreciated by more than 40% in the past week and by 75% since the end of last year, points to the perils of Iran’s leaders using economic policy to suit their own political interests. The collapse of the currency ignited protests on the streets of Tehran on Wednesday and some pundits are wondering whether inflation will spell the end of the regime. Iran is facing increasingly tough economic sanctions with potentially ruinous results for the regime. Over the summer, the EU began an embargo on imports of Iranian oil; it is now looking to clamp down on Iran’s central bank. The U.S. has already been pressuring purchasers to stop buying Iranian oil by threatening to block access to the American financial system to entities who deal with Iran’s central bank, which is Iran’s primary mechanism for processing oil sales. One reason the rial has depreciated so much in such a short span of time is because sanctions have choked off the sale of oil. Oil exports are Iran’s biggest source of hard currency, so fewer sales equate to a reduced availability of dollars. Scarcity has therefore pushed up their value relative to the rial, with too many rials chasing too few dollars. This is only set to get worse: the International Energy Agency estimated that Iran exported 1.1 million barrels of oil per day in August, a 56% drop compared with December of last year. Meanwhile, those countries that are still purchasing Iran’s oil are finding it extremely difficult to transfer foreign currency payments. At moments of uncertainty, the Iranian government needs to present a united and decisive front. It needs to show that it has a clear economic prescription to cure the country’s current economic crisis in order to bolster consumer confidence and arrest the rial’s freefall. Instead, Siyasat Bazee has made the situation worse. Iranian consumers are confronted with the spectacle of petty factionalism and political haymaking. The powerful Islamic Revolutionary Guards Corps is exploiting the current crisis to settle scores with President Ahmadinejad by publishing articles and caricatures on its affiliated news sites. Meanwhile, the president and his parliamentary rival, speaker Ali Larijani, are each using the crisis to publicly criticize one another. 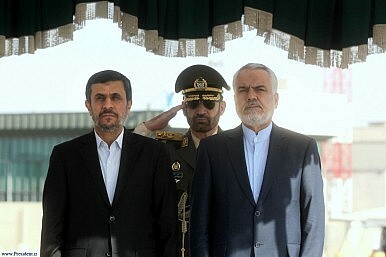 Ahmadinejad has defended his record from claims of economic mismanagement and blamed Western sanctions for the fall of the rial. Yet the president has undoubtedly contributed to the country’s problems. Since 2005, his frequent, populist cash-handouts have increased the money supply by nearly 500% and pushed up inflation with a flood of cheap rials. Ahmadinejad is not the only person at fault. Supreme Leader Ayatollah Ali Khamenei has played politics too, perhaps more so than anybody else. Part of the strength of his leadership is based on keeping different political factions divided, so that they don’t become strong enough to challenge him. This has encouraged intense infighting, where each faction tries to outmaneuver the other with Siyasat Bazee instead of working together collectively to tackle Iran’s problems. In fact, it is Khamenei’s politicization of the nuclear program which has hurt his regime the most. He does not permit deviation from, or open debate about, the official line on the direction of the program. Khamenei has taken what is essentially a nationalistic project that enjoyed widespread consensus and turned it into a divisive issue. Khamenei’s Siyasat Bazee with the nuclear program has weakened the regime and crippled its performance in the face of economic challenges. What makes Siyasat Bazee even more dangerous than Stuxnet is that it feeds on Iran’s abundant supply of internal divisions. That is basically its code. Until such time as Khamenei decides to work on creating consensus within his regime, the West can rely on one of the world’s oldest political ailments to cripple Iran more effectively than its enemies intervention ever could.